In all our brilliant years as humans, we’ve discovered one very important thing. Behind anything great, you need a strong back bone. While this of course, applies to the human body and spirit, in many other ways it applies to other functional things. Without all four legs of a table, it would topple over. Without the load bearing walls of a home, it would quickly collapse! Just like the backbone of our body, without the transom on a powerboat, the boat will never be seaworthy. The transom is basically a horizontal beam that reinforces the stern of a boat. It must be the toughest part of the boat as it has to endure a lot of abuse. If you are in the Mpls/St Paul MN area and you think your transom needs repair or replacement, Anchor Marine Repair has got you covered. What Does The Transom of a Boat Do? Anyone ever heard the Alan Jackson song, Drive. It talks about Mr. Jackson’s first encounter driving a boat. He sings that they had an old plywood boat for years until the transom got rotten. Well Mr. Jackson, if you had taken that boat to Anchor Marine Repair, it’s quite likely that the boat filled with so many memories could still be running today! The transom is so important to any power boat because it basically holds the forces of the boat all together. It carries the pounding of the hull back to the engine as well as transmitting the full power of the engine to the hull. The transom is the point where both of these forces collide to make your boat glide across the water! Because it sees so much action, the transom is known to wear and tear, no matter how stoutly it was when it was first built. No one should be out on the water with a weakened transom. Without a properly functioning transom, you are putting both your boat and the people riding along in jeopardy. So what should you do? Call us to repair it of course! Our experienced technicians at Anchor Marine Repair have a deep understanding of all different types of transoms. Every boat is different and the curves of a transom is always tailored to the type of boat you own. Therefore you need a professional that can differentiate your needs. Some boats have splash molds, some have stringers, some have unforeseen hurdles and some even have to have the floors removed. Successfully repairing your transom, and sometimes even the deck, is not a d-i-y job. 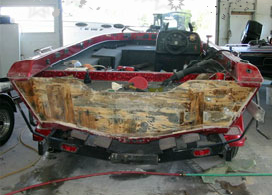 We can fix your boat properly and quickly so that you can get yourself back on the water quickly. From repair to replacement services, Anchor Marine Repair can fix anything wrong with your boat. If you live in the Mpls/ St Paul MN area and you think your boat transom needs a repair or replacement, call Anchor Marine Repair today at 763-972-3540.